He's everywhere. Or at least, his picture is everywhere. His is the face - with and without facial hair - that launched a million police notices, MMS messages, newspaper articles (including this one), blog posts and Prison Break parodies. For better or worse, escaped terrorist Mas Selamat Kastari is now the most famous man in Singapore. He is more recognisable than MediaCorp's biggest stars without having to give a single magazine interview about his love life. And more notorious than Paris Hilton, Lindsay Lohan and Britney Spears combined without having to make a single music video in a low-cut costume. Even my children, who are in primary school, know who Mas Selamat is, but not the name of the minister who had to apologise for his escape. 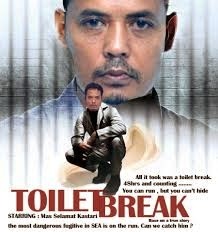 Mas Selamat's mugshot has become a local pop culture icon, T-shirt-worthy even. Young entrepreneurs are hawking apparel printed with the former bus mechanic's apparently copyright-free image online. How do I know Mas Selamat is a former bus mechanic? From his surprisingly up-to-date Wikipedia page, of course. 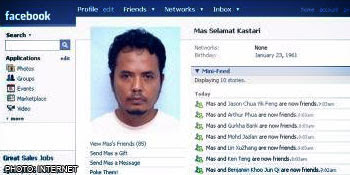 Have the police tried searching for Mas Selamat in cyberspace? Because there are at least 11 people on social networking site Friendster by that name. And I have just added "Mas Selamat" as a friend on Facebook and according to his profile, he is playing Texas Hold'em Poker. Never one to shy from jumping on the bandwagon despite a bad knee, I also created my own MySpace page as "Mas Selamat" at myspace.com/masselamat, as well as a LinkedIn page. Unfortunately, others with more finely-tuned bandwagon-jumping reflexes have already beaten me to masselamat.blogspot.com, masselamat@gmail.com and masselamat@yahoo.com. Even the domain name masselamat.com has already been taken by someone in Gilbratar - on 1 Mar, a mere three days after Mas Selamat's disappearing act. Talk about quick reflexes. The good news, if you can call it that, is that as of this writing, the domains masselamat.net and masselamat.org are still available. Are we making light of a serious incident that is potentially deadly to the country and region? Or worse, exploiting it? Well, Mel Brooks made The Producers - a movie, and then a musical based on the movie, and then a movie based on the musical - about making a musical called Springtime For Hitler and he won awards for it. And Adolf Hitler killed literally millions of people. Mas Selamat has killed no one as far as we know. So which is more in bad taste, a musical about Hitler or a Mas Selamat T-shirt? Is there a difference? The difference is Hitler is history. He is dead and poses no immediate threat to our security (unless those rumours about his clones hiding out in South America turn out to be true). Mas Selamat is not dead as far as we know. He is very much an ongoing concern. Hitler can't kill any more people. Mas Selamat can. Also, Mel Brooks made Blazing Saddles and Young Frankenstein, so he can get away with just about anything. Anyway, I may still order that Mas Selamat hoodie from cafepress.com. Just for the irony of it. I wonder if they accept PayPal.